This is completely untouched food from just one lunch period in one school. Before schools implemented the We Future Cycle Recycling program, this untouched food went unnoticed right into the garbage can. However, now as additional benefit to source separating in the lunchroom this food is sorted into a share basket, ready to be consumed by either other children within the school during lunch, afterschool program or while being at the nurses office, or donating it to a local soup kitchen. Both is legal, safe and infinitely preferred over just trashing it. We Future Cycle is often met with resistance when suggesting to donate the sorted out food. Standard practice in the school cafeterias is that if the milk runs out of date over the weekend, instead of donating it on Friday, it is being tossed on Monday, packaging at all. Arguments given are that food service does not want to be liable should someone get sick when consuming donated food, or that it is illegal to donate tax payer sponsored food, or that it is too much work to organize the logistics around food donation. As a matter of fact, it is not only legal, but also encouraged to donate the food. The Good Samaritan Act holds any donor harmless and We Future Cycle will pair the school up with the closest local, health department vetted soup kitchen, that will come and pick up right after lunch. A complete Win Win situation for all parties. And think about the social lesson to the children if they are involved in the process. However, the best way to avoid untouched food waste is to teach the children (and their parents) about choices and how to refuse when they do not intend to consume a food item. 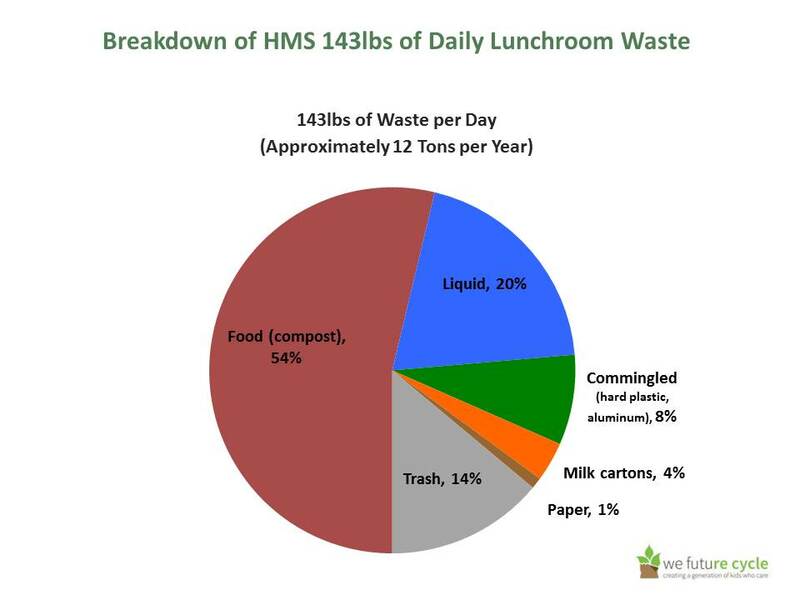 In the lunchrooms we see so many children dumping the lovingly made sandwich from mom right into compost, without ever taking a bite out of it. And off they go to stand in line at the snack desk to buy chips and ice cream. I am sure there is a better way. Let’s tackle it to make a difference. The success of source separating lunchrooms and teaching students about sustainable practices depends immensely on partnership with food service. The equation is easy, what goes in, must come back out. If food service sends many single serve packaging into the lunchroom, it makes sorting very difficult, potentially contaminating the food waste with plastic and ending up in the trash (or on the floor). Have you ever tried peeling a sticky opened ketchup pouch off a tray? Not a pretty picture. 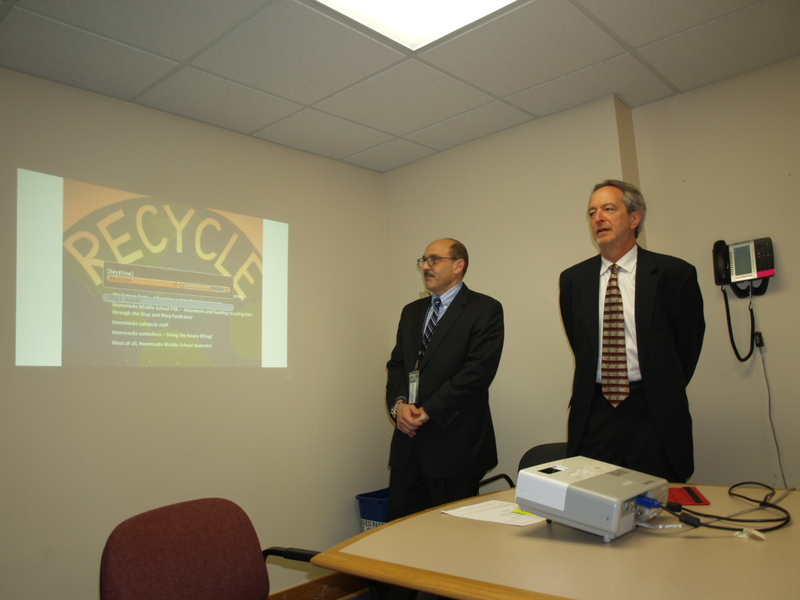 Ed Marra, Director of Food Service for the White Plains City School District, is a fabulous team player who took the We Future Cycle recycling program as chance to educate all his staff in sustainable practices. While only two of White Plains schools are piloting the program right now, Mr Marra knew that all school employees can benefit from this kind of education. He invited Anna Giordano to the Superintendents Training Day at White Plains High School to educate the staff not only about how the program works and what the children are learning, but going the extra mile to outline the environmental and social foot print each material has. Cafeteria Manager Sadie Tatum shared that she had no idea that Aluminum foil comes from strip mining the rain forest and she has immediately stopped using aluminum foil in her cafeteria and her home. Ms Tatum and her team excitedly set up their kitchen to follow the same sorting guidelines and all are stunned to see that at the end of a day, they had less then a quarter office size bin as trash. All food, packaging and soft plastic was sorted out to be composted and recycled, and the only trash was gloves and dirty soft plastics. “It is not hard, no big deal at all to sort”, Ms Tatum said when asked on how the system affected her normal day. Mr. Marra actively supports the program by eliminating most single serve packaging, replacing them with squeeze bottles and dispensers. He also affected the change that bagel condiments were made “by choice” items and not just placed on the tray of the children, whether they wanted the creme cheese or not. These kinds of adjustments are often met with resistance. Arguments against replacing single serve ketchup pouches are that it is too much work to refill the squeeze bottles, or the students would take too much. However in White Plains, thanks to Mr Marra’s decisive leadership and the training, the transition was flawless and it allowed Church St Elementary School to become a new Zero Waste Facility with less then 1.7% of trash, or only 3 lbs (!!!) of trash coming out of a lunchroom with 800 students. White Plains Church St Elementary School under the leadership of Principal Myra Castillo and Assistant Principal Merle Jackson have reached nearly Zero Waste with only 3 lbs of trash from nearly 700 students in the lunchroom. Outstanding! Ms Castillo knew that this program can only work if all departments work together for a common goal. She allowed time for food service, facilities, teachers and teachers aids to be trained on why the We Future Cycle recycling program is so valuable for the social development of the students. And both Ms Castillo and Ms Jackson are putting their money where their mouth is and are actively participating in teaching the students on how to sort. The system is easy. First the students empty their left over liquids into the bucket, sorting the container into either milk cartons or commingled, then all remaining plastic is sorted into commingled, all food waste and paper products are dumped into compost and the tray is stacked neatly. Done. Church St had a whopping 76 lbs of excess liquid, a large bag of commingled, 2 large bags of milk cartons, 75.5 lbs of compostable material and only 3 lbs of trash, that is 1.7%. Nearly Zero Waste! Only the students that bring lunch from home in disposable packaging are contributing to trash. Non recyclable are chip bags, drink pouches, soft plastic wrappers, sandwich baggies, go go squeeze packaging and things along those lines. Next steps will be to actively involve parents to be part of the zero waste solution. A huge shout out to Head Custodian Jody Raynor, whose support in this program is invaluable. He is being called ” Mr Smiles” by the students. Trust me, I am not making this up. He does smile all the time, while helping the students to sort. Truly WAY TO GO! Church St Elementary School is a prime example on how support by all departments can lead to something as fabulous as nearly zero waste. 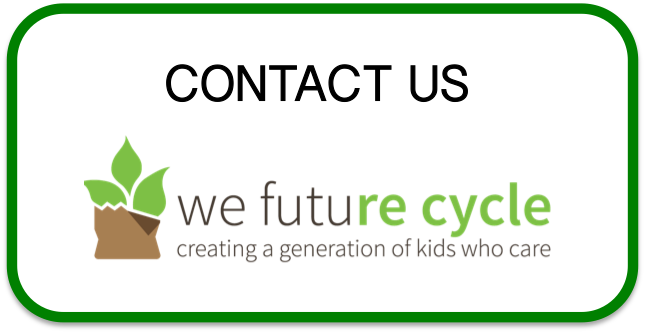 Enid Blount Press joined WeFutureCycle to help be part of the solution of recycling and composting in the schools in 2015. Enid is a mom and a professional musician. On the day her 2nd Grade daughter came home, distraught that the school had brought back Styrofoam trays in the lunchroom, she decided to call the school system and ask what their plan was for bringing back compostable trays. Their response was that the cardboard trays would be back 5 months later, in the fall. Joining Anna Giordano, who was behind getting the Styrofoam out of the schools, was her next step. Enid now helps in the New Rochelle school system as well as other schools with the composting and recycling in the lunchrooms. Enid is “thrilled to help tackle the waste” and provide a better environmental education for our community along with her colleagues. We Future Cycle is extremely proud to have Enid. She immediately jumped into action by joining the implementation at the White Plains Church St Elementary School. When you say ” I am throwing something away” , where is “away”? That is a question students at Church St Elementary school learned the answer to. And they didn’t like it, not one bit. Looking at pictures of land fills and incinerators brought even the littlest students to a open mouthed gasp. November 6th 2015 was launch date of the We Future Cycle Recycling program at Church St and it started with assemblies to all students in the auditorium. In a lively presentation, students learned to look differently at packaging material. What they first considered trash, they saw later as raw material for new things, the premise of recycling. What they first saw as a yummy snack, they later saw as food that created trash because of its unrecyclable packaging. They also learned just how much garbage is generated at a school, something they had never thought of before. And they learned, that most of what they generate can be recycled if it was just sorted out. Now they are chomping at the bit to start sorting. 6 Safety Squat students were chosen to assist with the “before recycling” waste audit. They stood open mouthed in front of the 15 bags of bulging trash. They weighed each bag, we calculated totals, looked at median bag weights, offered suggestions why some bags were much heavier then others, while not being necessarily more bulky. Suggestions included that the bags may have come from younger students as there was more heavy food and more left over liquid in these bags. Church St generated that day 15 bags of trash, weighing a total of 204 lbs. Anna Giordano, from We Future Cycle, asked the students to imagine what a ton of garbage looked like. Step by step, the students worked to identify that 200 of their own lunchroom bags would equal 2000 lbs. Upon learning that Westchester Ct generates more then 2300 tons of garbage per day, one boy sadly commented “and that is just Westchester”. A very mature deduction from a 5th grader. From Monday Nov 9th, Church St students will be separating their lunchroom waste into waste liquid, milk cartons, commingled and food waste and the students are looking forward to diverting an estimated 90% away from trash and into recycling. Church St is all geared up to make a difference. Way to go!